Try this spring Bible lesson for preschool children – Jesus Walks on Water – and see how quickly the kids learn while having fun. This is an excellent way to teach preschool children about faith, trust and feeling safe with Jesus. This Sunday school lesson plan is great as a stand-alone teaching tool or as part of a preschool ministry curriculum. The Bible story of Jesus walking on water takes place after the miracle of Jesus feeding 5,000 people with two fish and five loaves. This lesson takes 30 to 60 minutes to complete. This Sunday school lesson teaches the children to trust Jesus. The kids learn the Bible story interactively, sing a memory verse and finish a craft project. This lesson builds on a previous lesson about Jesus feeding the 5,000. The disciples departed by boat and Jesus went to pray after the miracle of the fish and loaves. The educational objective of the lesson is to teach the children to keep their eyes on Jesus and He will keep them safe. Read and know the story found in Matthew 14:22-23. Tell the Bible story in your own words to the class, using a water table or the plastic tub filled with water and the toys to illustrate Jesus and Peter walking on the water. Show them what happened when Peter took his eyes off Jesus. Use the suggested discussion questions interspersed in the story to keep their attention. How did the disciples feel when they saw Jesus walking on the water? How would you feel if you saw someone walk on water? Who walked on the water to meet Jesus? What happened when Peter took his eyes off Jesus? Try this easy way to teach preschoolers scripture verses by using a method called piggyback tunes. Since the kids know the musical tune, only the scripture words need to be learned. Verses are learned quickly and retained longer with this method. Use Matthew 14:27, 31 sung to the tune of “Ten Little Indians." Give each child a piece of construction paper. Help them glue the wave shapes onto the paper. Use the other shapes to form a simple boat. Glue the paper figures onto the waves to represent Jesus and Peter. Let the children color the pictures and send them home as a reminder of the spring Bible lesson for preschool children. 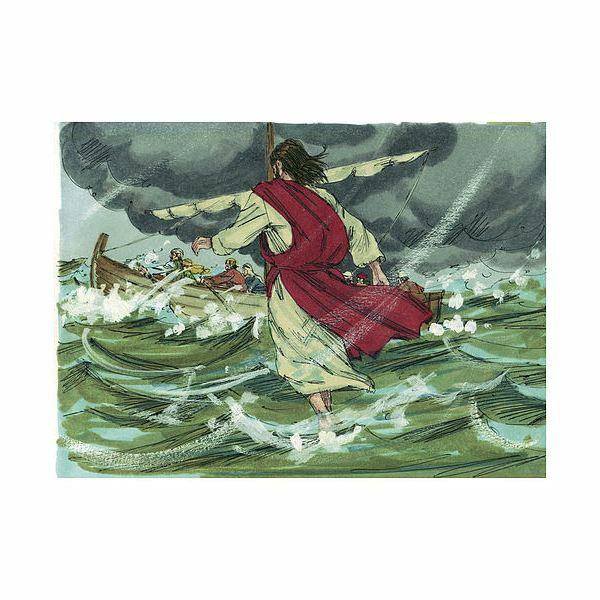 This spring Bible lesson for preschool children – Jesus Walks on Water – can be used as an introductory Sunday school lesson plan on the miracles of Jesus Christ. Follow it up with stories about miraculous healing and other signs and wonders of the New Testament, or stories about how Jesus calmed the storm.